On Saturday, the 28th April, 1917 soldiers from the 3rd Battalion, Dorset Regiment were participating in a live firing exercise on the rifle range at the Fleet, Wyke Regis, Weymouth. At the conclusion of their rifle firing practice the order had been given by the officer-in-charge to cease fire and unload rifles. The officer inspected the rifles to ensure that no bullets were in the magazines and the men could then return to their camp. As the men began to leave a soldier named Hillyard was aware that there was a problem with his rifle. It was a new pattern rifle, borrowed from another soldier which Hillyard had not used before. The soldiers, many newly recruited had been issued whilst in training with an old pattern rifle. Hillyard could not slide the bolt of the new pattern rifle back and he returned it to Private Wellen the soldier, from whom he had borrowed it. Private Wellen in turn passed the jammed rifle to Lance-Corporal Travis who managed to free the bolt and pressed the trigger. Unfortunately there was a live round in the magazine chamber. At the moment of discharge the rifle was pointing directly at a private soldier and he was shot and instantly killed. A doctor from Monte Video Camp was sent for and on arrival pronounced that Private Alfred Carter was dead having been shot through the right arm into his right side and through his liver. Later it was established that his death was due to haemorrhaging. He was 18 years of age. Alfred Henry Carter was born at St Helier, Jersey in 1899 the son of Alfred Denzil and Clara Carter. Like his father who was a serving soldier, Alfred Henry joined the Army and sadly had a very short career. He had been posted to the 3rd Battalion, Dorset Regiment, for training after which he would have been drafted to a regular unit. The Coroner for South Dorset, Mr G.P. Symes held an inquest at the Guildhall on Monday afternoon, 30th April, into the circumstances which led to the death of Private Carter. Quartermaster-Sergeant Frederick Collins identified the body and told the court that Private Carter came from Jersey. Giving evidence Private Edgar Hillyard stated that he borrowed a new pattern rifle from Private Wellen towards the end of his firing practice. He put a five round clip into the magazine and fired two. The order had been given to cease fire and unload. Before the bolt jammed he had ejected two rounds from the magazine. As only two rounds were ejected he therefore thought that he must have fired three shots. He then gave the rifle back to Private Wellen, and told him it was jammed. The Coroner commented that he should have used his own rifle instead of a borrowed one. Mr Symes was also of the opinion that newly recruited men must be given proper instruction before they used any type of rifle. Private William Wellen stated that he had no rifle of his own for use on the Saturday in question and had borrowed one to do his firing. A new pattern rifle was also available but he knew that no orders had been given for its use. Private Hillyard had asked him if he could fire a couple of rounds with the new rifle and Wellen agreed. When they began to return to the camp Hillyard gave the rifle back to him, mentioning that it was jammed. Wellen himself was unable to free it and gave it to Lance-Corporal Travis adding that the bolt appeared to cover the magazine but he was not sure. Although the bolt could be moved backwards it would not go further forward than the head of the breech. He was unaware that there was a bullet in the magazine. Lance-Corporal Bernard Travers said that at the end of the firing practice he was waiting to go back to camp with the men when Private Wellen brought him the new rifle with its bolt jammed. He was aware that the new pattern rifle should not have been used but said nothing to Wellen. Holding the new rifle he managed to force the bolt free which was just entering the breech. It did not occur to him that there might still be a live round in the magazine. After struggling to free the bolt he automatically pulled the trigger. The rifle discharged the round and killed Private Carter who was standing a yard from him. Second Lieutenant W. Clark, who was in charge of the rifle firing practice, said he was not aware that a new pattern rifle had been brought to range and even if it had, it should not have been used. He had inspected all the soldier's rifles to check they were unloaded. The old rifles were easily checked as it was possible to see the bullets but this was not the case with the new pattern. The Second Lieutenant admitted that he must have overlooked the fact that a new rifle had been used. After hearing all the statements given by the witnesses the Coroner summed up the evidence for the jury who returned a verdict of "accidental death". 'Mrs Carter of 4 Prospect Cottages, Haimance Place, Ann Street, was shocked on Saturday to receive a telegram from the Officer Commanding the 3rd Dorsets conveying the tragic news that her son, Private A.H. Carter of the Dorset Regiment, who was in training in England had been accidentally killed on the rifle range at Wyke Regis near Weymouth this morning. Needless to say the bereaved mother is heartbroken by the news for the lad, who was in his 18th year, had only been in the Army a very short time. 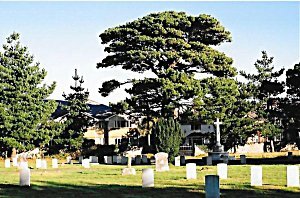 He was the son of Pioneer Sergeant Carter, now serving in India, and had for a long time been keen on following his father's footsteps and serving his King and Country, so that his mother consented to his enlistment at an early age. Letters received recently stated his section was engaged on a musketry course, Saturday being the last day for firing. No details are to hand as to how the young lad met his death. We feel sure the sympathy of all our readers will be extended to the mother'. Just over a year later Mrs Carter received more sad news when she learnt of the death of her husband in India. Sergeant Alfred Denzil Carter was serving with the Lincolnshire Regiment in the 1st Garrison Battalion, at Culcutta. He died aged 50 years on the 29th March, 1918 and lies buried in Calcutta (Bhowanipore) Cemetery. 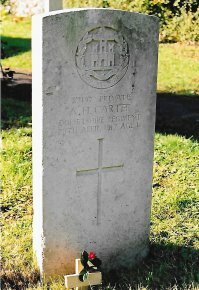 27197 Private Alfred Henry Carter, 3rd Battalion, Dorset Regiment was buried in Melcombe Regis Cemetery, Weymouth with full military honours. Grave Location: Section III, Row C, Grave No.2695. The 3rd Battalion, Dorset Regiment recruited and trained men and officers for reinforcement drafts. Originally titled the Dorset Militia until 1907 when Army reorganisations by Lord Haldane were implemented. Unfortunately, as The History of the Dorsetshire Regiment 1914-1919 relates the records of the 3rd Battalion were lost. [Source: Jersey Evening Post ~ 30th April, 1917. Southern Times ~ 6th May, 1917.